We LOVE being single.And,sometimes its better to be on our own. Skin is the biggest organs on our body. We really need to take care of it always especially our face skin. Different part of skin carry a different moisture and different sensitivity. Face skin is one of our skin part which is quite sensitive. That's why we really need to take a very good care of it. 1) Through our everyday diet and what we eat. This is the best way to enhance our skin, that's why there are many collagen and anti aging drinks on market nowadays. It is the best way as it enter your blood circulation and it helps you to rebuild the tissue from inside. The vitamins from vegetables and fruit that we ate can be absorb easily and more effective. However, must we remember not all kind of food will give goods to you skin. Sugary stuff can cause wrinkles and immature aging and food which contain too much of oil will make your skin oily. External way is when we apply skincare product or any homemade recipes on our skin. The external way have three basic way of cleansing, toning and moisturizing followed by some other intensive steps such as applying serum and eye cream. 1) Dark Chocolate: It full with antioxidant which chase away the toxic from your skin. 2) Spinach: contains vitamin A and C which is good for your skin. 3) Olive oil: for it's healthy fats. 5) Almonds: Increase the levels of vitamins E for your skin. 6) Fish : the omega 3 fatty acids which helps you skin from dryness. 7) Green tea : proven effective in fighting skin aging. 8) Oats: Heal and soothe your skin from inflammation. And last but not least, The most important!! room. Water is the key to a healthier skin. The Nanowhite products is suitable for all skin types. What is good about it is that it not only help you achieved a fairer skin but also it helps you fade away the scars and also heal pimply skin effectively and also moisturized your skin. The whitening effect also is not so drastic, it did not involved unhealthy peeling which will effect you skin later. Furthermore, it will also help in fighting pigmentation or pregnancy mask. 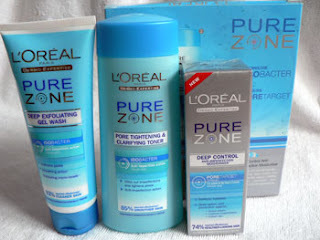 The Loreal Purezone Product is undeniable in their effectiveness of fighting oily and pimply skin. The product explore to each of your pores to give a overall cleansing without stripping your skin own's moisture and will make your skin feeling matte and healthy longer. Its also make your pimple take a shorter time to heal. The toner is so refreshing and it also smells good. I have to admit this product is good and its really help your skin glow from the inside and faster too! I say it because I have used it before. If your skin is dull and tired looking, you should try this line Moistful Collagen cream. Best wear it before you go to sleep because when you wake up the next day, you will have a healthier and prettier skin. 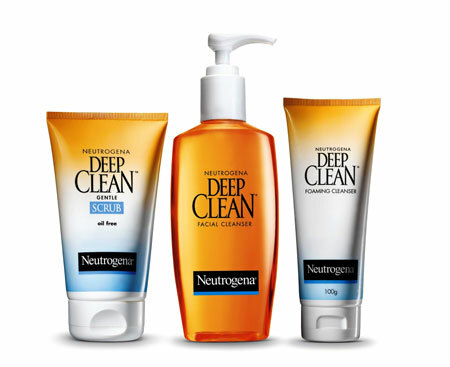 If you looking for products which offer you a healthy, glowing and moisturized then you should try this product. This product really do wonder in combating against blackhead. I really love their daily scrub. It exfoliates your skin gently but effectively. The orange colour on the tube give you a happy mood everytime you are using them. The amount which you need to use for every wash is also quite little which make it quite economical. There you go girls, some food and beauty products which can help you achieved a more beautiful skin. We're single and we're like it! Great to have u here! u can leave comments, ideas or even chat with us!